Most children love all things Halloween. As adults, we assume it's because Halloween means candy and children generally love candy. 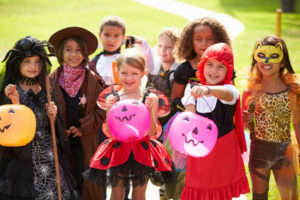 But many children love more than just the abundance of candy at Halloween time. They really get into the ghoulish aspect of the holiday and delight in the displays of goopy brains and squishy body parts. Halloween games, therefore, can be really fun and goopy, if you wish. The kids will go with it, don't worry. First up, a brain game. There's a fun game on store shelves where you pick through a rubber "brain" to figure out what's in it. You can create this easily yourself. Make some jello and fill it with a variety of items, like gummy worms and other gummy candies, some small candy and trinkets and other items. Tell the children to root around in the bowl of jello (call it a "brain" if this will get the kids more interested) to figure out what's in it. It's goopy and messy and kids love it. Best yet, color the jello black so it's too dark to see what's inside and it looks more like goopy brain matter (the way kids see it, anyway). In that same, or similar vein, kids love the spaghetti game. Be sure they are wearing a smock over their clothes or are wearing play clothes before playing this game. Make a big bowl of spaghetti and fill it with all kinds of items, like plastic bugs, gummy worms and other items that might feel a bit strange. Make the children feel around in the bowl of spaghetti and identify the items they feel. Once they are done and cleaned up, have them list as many items as they can remember. Whoever gets the most items listed (and right) gets a prize. Spaghetti, anyone? Another similar game that's always popular is to take a cardboard box and paint it black, both the inside and outside. Carve a small hole in the top, really just large enough for the children to get their hands into, and fill the box with a variety of items. They can be related to Halloween (like a small pumpkin) or not (wrapped Tootsie rolls or a tiny toy Hummer car). Have the children guess what's inside the box and award the box itself to the child who guesses the most number of items correctly. To make this goopy and silly, be sure to include some items that might feel like body parts or brain matter. Kids love creating silly fictional stories, often with absurd plotlines. Halloween is the optimum time to let them run wild with their imaginations. Have them spend a bit of time writing out the scariest story they can think of. Some children might need some direction not to make it ridiculously grotesque, so use caution with these children in your clarification of this assignment. Once the stories are written, have the children hand them in and then have a guest reader for each one of them. Each child will come to the front of the class and read the story with as much dramatization as they can muster. Once the story is read, everyone has to guess who wrote the story. The writer should play along, otherwise everyone will know it was their story! The winner is the child who wrote a story so intriguing and unusual that nobody knew it was his or hers! Kids love the word find games when you give them a word or words relating to a holiday or something else and have them find words within those words. In this case, give them Halloween-related words and ask them to find as many scary words as they can. For example, you might give them the word "Halloween" and see how many scary words they can make from the letters. Or you could give them a series of words and let them rearrange the letters in all of the words to create scary words, or even create a story from the scary words. Put a time limit on this game and award a prize for the child who creates the most words in the least amount of time.